The Chicago School now educates the largest and most influential generation since the Baby Boomers. We take a closer look at how Millennials are shaping the future of American society—how we live, work, study, and play. Christopher McMullen was 18 when Barack Obama was elected as the first black president of the U.S., but that iconic campaign slogan—and the movement that resulted from the historic political race—continues to define him and his generation. McMullen’s own life story growing up in Macon, Ga., is an example of that. He was 9 when his father died. The devastating loss left him angry and confused. And yet, he overcame those challenges to achieve the one dream his mother had for her son—becoming the first person in their family to get a college degree. It certainly wasn’t an easy journey and at times, he says it even seems “far-fetched” that he could be where he is today—a young black man getting a doctoral degree in psychology. But he made it. Just like many of his contemporaries are doing things others once thought impossible. They are the Millennials, and as McMullen puts it, they are fearless. And yet, that’s hardly what you see in the media these days as corporations and pundits seek to understand what the Pew Research Center has determined is the nation’s largest and most influential demographic since the Baby Boomers. Derided as spoiled and overprotected, disparaged as over-confident and even narcissistic, and scorned for their disdain of traditional values and lifestyles that they view as antiquated—or worse, irrelevant—the Millennials have provided fodder for years of best-selling books, endless data-crunching, and interminable speculation about exactly who and what they will grow up to become. Predictions about the impact this generation would have as they came of age varied wildly: they would be the smartest, but least financially successful generation; they would find themselves shamefully unprepared for the expectations of the workplace; they would turn many a tried-and-true way of thinking on its head; they would reset the business agenda of the 21st century and change the way we think about money, work, marriage equality, religion, politics, and more. Well, here we are in 2016, some 14 to 20 years—depending on which definition you choose—after the most privileged of Millennial babies settled into their color-coordinated, child-proofed nurseries. The generation has officially grown up, many of them 20- and 30-somethings who have already begun to leave an indelible mark on everything from the consumer marketplace to the workplace to yes, even the world of professional psychology and behavioral health sciences. Dr. Heather Sheets, dean of The Chicago School’s Washington, D.C. Campus, says students like McMullen embody the future of the university. In response, TCSPP is tailoring its services—both academic and administrative—to the needs of this generation. Many academic programs have been customized to meet the needs of Millennials who want to spend as little time on campus as possible or to rely on their laptops and tablets for instruction. Applied Behavior Analysis is just one example of a program that has been revamped into a blended format that only requires students to step into a classroom every other weekend, while the Online Campus has launched several new programs as well. All student information is now centralized on a one-stop website, so that processes that previously required forms, email inquiries, and personal visits can now be performed with a minimal number of keyboard strokes. Even student events are being designed with the Millennial love of convenience and low-commitment options in mind. The Chicago School has also added extra campus support for this evolving demographic in the form of a Student Success Specialist. Available by email, Skype, or in person, this addition to the Student Affairs Office troubleshoots problems that range from course schedules to account balances and re-entry procedures. For McMullen, that success is already happening. And while McMullen says making a graduate psychology education more “convenient” is attractive to his Millennial peers, what he values most about his TCSPP educational experience so far has been the diversity of opportunities to stay engaged and give back. In addition to working on campus as a student admissions representative and graduate assistant, he spent two months working as a corps member at City Year Los Angeles, providing emotional and educational support to children in struggling socioeconomic areas. He’s also a member of the Association of Black Psychologists and incoming president of the Black Student Union with plans to spearhead a minority mental health conference in the L.A. community next summer, before he even graduates. Dr. Sheets sees that Millennials—who grew up with the world at their fingertips through technology—exemplify an intrinsic desire to change society for the better, not just in their own communities, but on a global scale. Service has long been the backbone of The Chicago School experience. Students become involved in community service beginning in their first semester and continue throughout their academic career—through service-learning courses, volunteer activities, and working with a wide range of nonprofits during their field experiences. And for more than three decades, their efforts have reached across five continents and dug deep into underserved areas in the U.S. They are training teachers in genocide-ravaged Rwanda to recognize and address the symptoms of trauma, helping address the mental health issues that plague residents of Los Angeles’ Skid Row, and working with Syrian refugees in Athens, Greece. But what’s different about this new influx of Millennial students, Dr. Sheets explains, is that like everything else they do, they are always questioning, always advocating, always pushing for more. For example, while faculty and staff at each campus had long observed an annual Community Day of Service, she says it was students at the Washington, D.C. Campus who asked to be included. 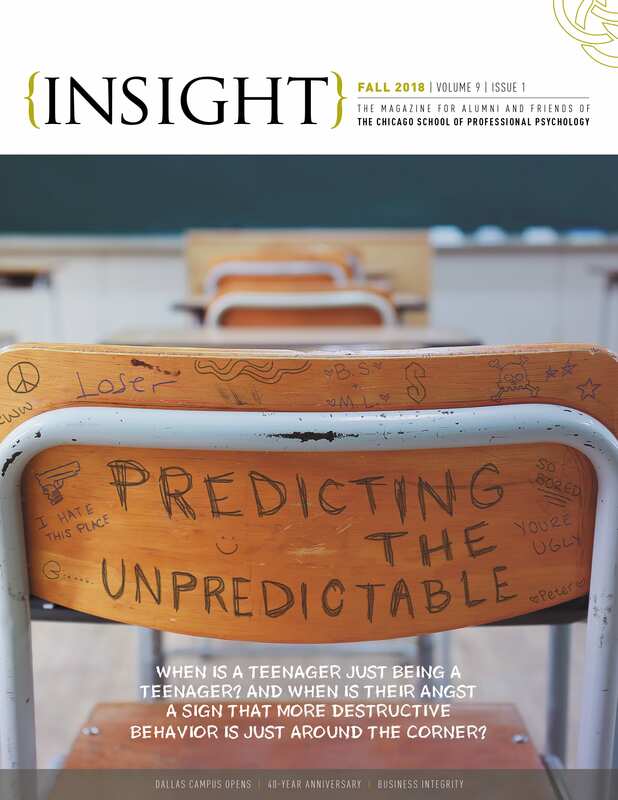 Perhaps this is only more evidence that Millennials have indeed discovered their clout in sheer numbers and the power of their new way of thinking—at The Chicago School and in the world at large. Every age group has its seminal events, incidents, or eras that give shape to attitudes that characterize the generation. Millennials spent their early years listening to stories about World War II, Vietnam, and the Kennedy assassination but, for them, growing up in the shadow of 9/11 is what colors their view of the world. Dr. Eleazar Eusebio, associate professor of school psychology at The Chicago School’s Chicago Campus, attributes much of the Millennial value system to the impact made by the attacks on the World Trade Center and Pentagon and the terrorist activity that has followed. 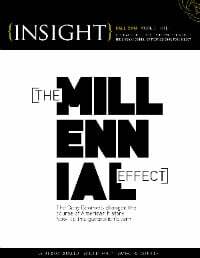 Millennials are certainly in a position to make a splash that cannot go unnoticed; at 75.4 million strong, they have eclipsed the Baby Boomers (currently counted at 74.9 million, according to the Pew Research Center) as the largest generation in American history. Millennial voters demonstrated that mindset in this year’s Democratic Presidential Primary by calling attention to such issues as climate change, student loan debt, and the need for a higher minimum wage. This generation has also revived some of the civil rights values of their Baby Boomer grandparents by calling attention to social justice issues through such movements as Black Lives Matter and Occupy Wall Street. The influence they wield, by virtue of their sheer numbers and their new ways of thinking and conducting daily business, is vast. And despite all the hand-wringing and prognosticating, they don’t seem at all troubled by the sometimes disparaging labels put upon them. Mara Justice, a 27-year-old Clinical Forensic Psy.D. student at the Los Angeles Campus, says while she is not fond of generalizations, she does see that her generation is ready to make a lasting mark on society. As McMullen says, this is a proud and hopeful generation. They embrace diversity of all kinds and define themselves on their own terms. The Millennial effect is real. From The Chicago School to the world at large, they will continue to influence how we navigate life and work in a constantly changing society. If you are interested in learning about programs offered at The Chicago School, visit our programs page or fill out the information below to request more information.